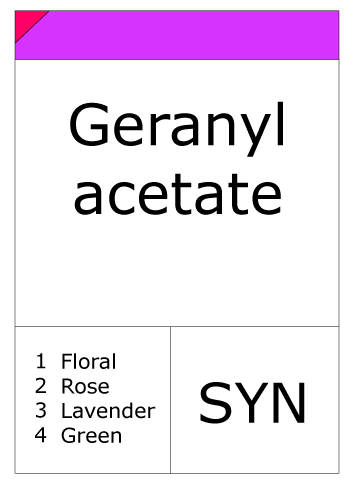 Geranyl acetate is a natural organic compound. It is a colorless liquid with a pleasant floral or fruity rose aroma. Its condensed liquid has a sightly yellow color. 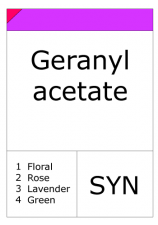 Geranyl acetate is a natural constituent of more than 60 essential oils, including Ceylon citronella, palmarosa, lemon grass, petit grain, f, geranium, coriander, carrot, Camden woollybutt, and sassafras. It can be obtained by fractional distillation of essential oils. It is used particularly in rose, lavender and geranium formulations where a sweet fruity or citrus aroma is desired.